CINELATION | Movie Reviews by Christopher Beaubien | Do You Know the Movies in the Facets Video Logo? This one was easy. Halfway through the Decalogue series, I had seen the Facets logo five times along with that little girl. Her face in profile immediately whips around to face forward, her eyes look oddly perceptive. She knows something, and it is disturbing. In Decalogues V, her attention is caught by a young man who has gone into a very dark place. The fifth out of ten Decalogues, a collection of twisted morality plays on the Ten Commandments, carries the adopted title, “Thou Shalt Not Kill”. Here Kieslowski, along with his co-writer and friend Krzysztof Piesiewicz, investigate the realities and contradictions of how we actually handle murder now. 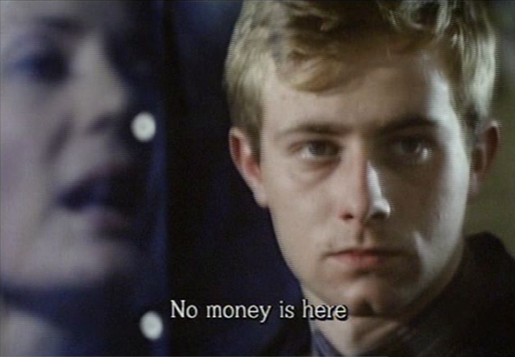 Jacek (Miroslaw Baka), a sullen youth walks the streets and randomly chooses a taxi driver as his victim. He strangles him so viciously that his vocal cords sound as if they were snapped in two. Kieslowski complicates matters by making the disaffected killer more approachable (even appealing at times – like Dexter Morgan, he’s good with kids) than his victim, who is a petty scumbag. However, the extreme violence to the taxi driver reminds us that no one deserves this. No matter how human Jacek comes across at times, his motives remain detached from true humanity. We may understand darkness in various degrees, but most don’t wish abandon light altogether. We then proceed to Jacek’s execution a year after the trial. The build-up to it is cold. The scenes between the killer and his idealistic lawyer are tactful, empathetic and realistic. After going through the wringer of this very bleak little film, we are left with an uneasy conflict. If it is loathsome for a individual to kill someone, then what makes society so different? Is capital punishment really justifiable? Everyone populating these deceptively simple human dramas is full of complications and pathos, just like you and me. That is what makes The Decalogue series such an extraordinary accomplishment. It avoids easy answers and mirrors people in our world with compassion and ruthlessness. No wonder it keeps finding its way into so many All-Time Great Movie lists on Sight and Sound from film critics (Roger Ebert, David Denby) to filmmakers (Gillies MacKinnon and Mira Nair). The music for all ten films by Zbigniew Preisner is especially moving. In Decalogue V, the wind-heavy instruments are mournful. The score contains hisses and scratches as if it were an old 78 vinyl record that was discovered in an attic, played along with the movie and was too good to substitute. 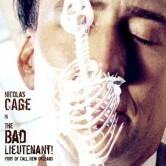 Listen for the occasional booms from a fat drum during the end credits – they work well to elicit that sinking feeling. This one baffles me most of all. Are these two film clips fading in and out simultaneously? OR are we looking at a clip from a single movie that has a static dissolve between the two shots? Is the Facets editor working on this montage really that sadistic? My mind is cluttered with thoughts like these. Decalogue V is back again. The first still from Decalogue V shows someone interacting with the young soon-to-be-killer. This next one here is of a dog who is tossed a sandwich by the taxi driver – the marked man. That description is misleading; the man’s offering was to spite his wife who made it for him. Given the many times he has acted like a creep, I wouldn’t put it past him to add some flavour – like a dash of arsenic. If one of these two shots each belong to the killer and then his victim, then the evidence is mounting that the Facets editor has a sly sense of humour. I suppose you could consider them two separate films if one came from Decalogue V and the other one was taken from the feature-length film A Short Film About Killing, which is (ironically) the extended version of Decalogue V by 25 more minutes. 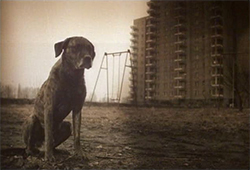 I got the sample images from Decalogue V.
FACTOID: Slawomir Idziak, the cinematographer of Decalogue V, manufactured hundreds of filters for each shot to fully control the dilution of color into those muddy and jaundiced hues. The sky looks like it was masked with dead skin. The results are perfect for such a bleak film. 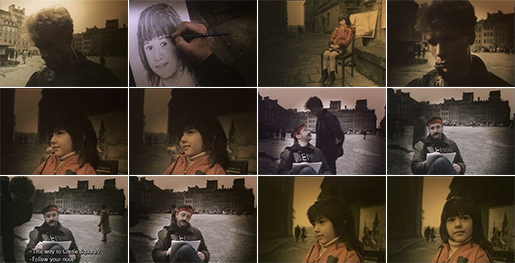 Kieslowski had initially balked at the thought of using filters, but Idziak insisted. After their success with Decalogue V, Idziak would work again with Kieslowski on two of their most sumptuously visual films The Double Life of Veronique (191) and Three Colors: Blue (1993). Those films relied heavily on filters too. In this still, Tomek (Olaf Lubaszenko) is engaged in an argument with his neighbour Magda (Grazyna Szapolowska) from behind the counter. This is the second time she has been sent to the post office to collect some money. She doesn’t know yet that it was Tomak who lied about the money just so he could see her. He’s in love. Late at night, he goes all Rear Window* and spies on her using a telescope into her apartment building opposite his own. Eventually she does find out about him. What she does next is unexpected and much more cruel than he ever deserved. Decalogue VI is hailed as one of the very best in series along with episodes I, II, VI and IX – it sounds like Star Wars. For such a dark drama, Kieslowski infuses this story with moments of joy – Tomak is never happier racing his bike full of milk bottles ecstatically after Magda agreed to go out with him. Why milk bottles? Because he moonlighted as a milkman so he could knock on her door. Ah, love! There is scary insight (the means a man who found release from the agony of toothache, which is something Supermasochist Bob Flanagan could also vouch for) as well as a deeply ironic role reversal between Tomek and Magda. 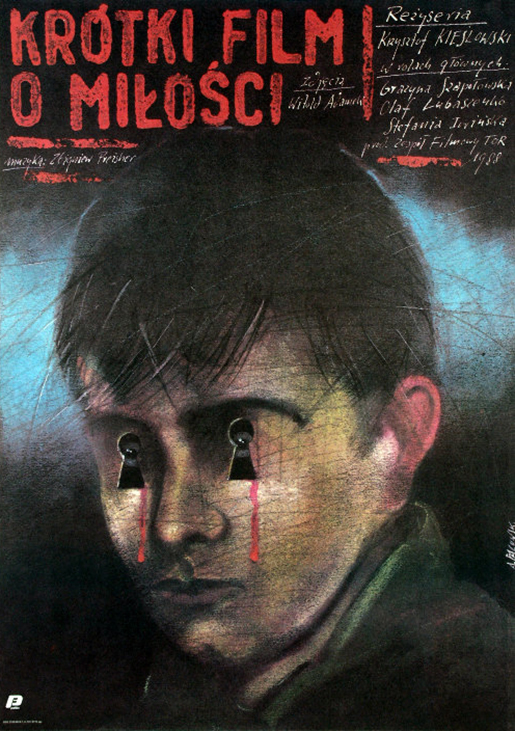 Check out some more Polish movie posters for Decalogue VI. Those illustrators sure know how to make an impact. *I already used up one reference to Monsieur Hire (1989/90) in my review of House on Haunted Hill (1999). Five years after I saw The Decalogue, I was watching one of the most bizarre films I had ever seen – and that’s really saying something! 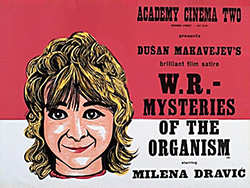 Two-thirds into Makavejev’s WR: Mysteries of the Organism (1971): Milena (Milena Dravic), a young Yugoslavian politico seated high in a balcony is watching a Russian ice skater perform on stage. This is Vladimir (Ivica Vidovic) who makes Milena’s eyes go googly and then she cups her cheeks with her hands out of total adoration. I knew that I had finally found the young woman’s face that glowed and reddened before dissolving into the Facets logo. That Vladimir sure looks good on ice skates, but he definitely does not know how to treat a lady! If you haven’t seen WR, you’ll probably freak out over this clip. It just about ends the film.